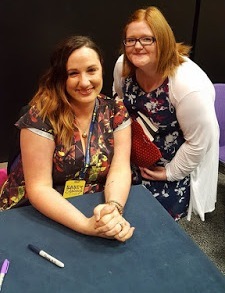 Todays Forgotten Friday is a Q&A with Tilly Tennant originally published 2015. What's your latest book The Accidental Guest about? It’s about Christmas day with the Meadows girls – Hannah, Gina and Jess – and the knock on the door during dinner that starts something very unexpected! It’s sort of a mystery wrapped up in a romance with a bit of comedy thrown in. I have to hand credit out to my family! I was really stuck for an idea after writing half a book that I was beginning to hate. I asked them to brainstorm with me and we chucked around ideas about all things Christmas until we got to guests coming for dinner and then the lightning bolt struck me. In 140 characters (length of a tweet) tell us why we should read The Accidental Guest? It’s a cosy festive romance and a mystery all wrapped up in one, so you get two stories for the price of one! What's your favourite thing to snack on whilst writing? My diet is terrible when I’m writing! It’s mostly biscuits, crisps and cups of tea and proper meals go out of the window. Sum up your writing journey in 5 words! Still have to pinch myself! I’m reading Written in the Scars by Mel Sherratt, who is a good friend of mine. It’s bloody brilliant. Her stories are always gritty, nothing like mine at all, but her characters feel like people you’d meet on the street. I try not to offer it because I don’t feel qualified. Everyone’s journey is different. I’ve made so many mistakes on mine and I’m still making them because I’m still learning and I think in many ways I always will be. The one thing I will say, which is not really advice but might help, is try to get a thick skin because you’re going to need it! What do you have in store for readers in the future? The follow up to The Accidental Guest, which is called I’m Not in Love, is due for release on 7th January, followed by part three of the series in February and part four in April. Then I have a full length novel planned for the summer, which has already been written but is undergoing rewrites and edits. After that, it’s all about where the muse takes me! What do you think of the Q&A? Have you any books by the author?